Australian consultants abruptly cancelled a public meeting scheduled for April 30 in Kunhing, southern Shan State, when over 300 local people, including a Shan MP, gathered to raise concerns about the planned Mong Ton megadam on the Salween River. On April 30 from 1 pm to 3:30 pm, over 300 local people from Kar Li, Kun Hing, Keng Lom, Keng Kham, Nong Kheo, Wieng Pui, Ho Pang, Hsai Khao, Wan Lao, Kung Pao, Hsai Khao Jarn, Wo Long, Na Pao, Wan Part, Nam Lan, Hsai Moan and Na Lin Lieng gathered at Nam Pang hall, Kunhing township, planning to stage a protest against a public meeting organized by the Australian Snowy Mountains Engineering Corporation (SMEC), which was to be held in the City Hall of Kunhing township. However, apparently due to news of the planned protest, the public meeting was abruptly cancelled. 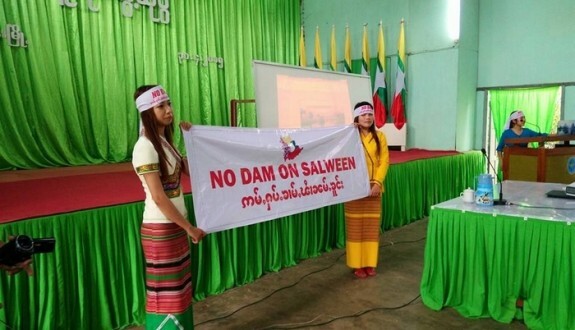 The protestors therefore held their own public gathering, including Nang Wah Nu, a Shan Nationalities Democratic Party MP for Kunhing, and released a statement demanding that the dam be halted. They raised concerns about the damaging impacts of the dam on thousands of people and historical sites, the lack of guarantee of political rights, and the fragility of current ceasefires. Kunhing township will be hugely impacted by the Mong Ton dam. The historical Keng Kham area, comprising over 100 villages along the Pang tributary, will be almost completely submerged, including numerous islands which give the township its name (Kunheng means “thousand islands” in Shan). The original population of the Keng Kham area is over 15,000, but many fled to Thailand to escape brutal anti-insurgency operations in 1996-1998, involving forced relocation of over 300,000 people in central Shan State. 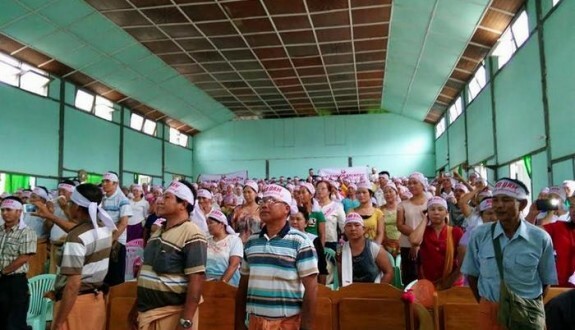 Last month, on April 6, SMEC organized a public meeting in Mong Ton, and about 150 people from Mong Ton and surrounding areas protested against the dam. If built, the Mong Ton dam will be the largest in Southeast Asia. It will produce 7,000 megawatts of electricity, 90% of which will be exported to China and Thailand. This mega dam is a joint venture between China Three Gorges Corporation, China Southern Power Grid, Sinohydro, The Electricity Generating Authority of Thailand, and the International Group of Entrepreneurs Co. (Myanmar). Attached is the statement from Kunhing people.